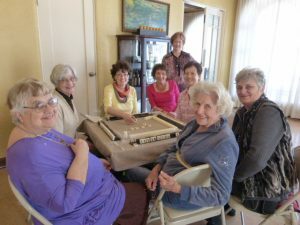 Mahjong meets on the second and fourth Monday of the month in the Fireside Room from 1:00 to 3:30 p.m. The Mahjong group was organized in 2010 for all levels of players. All are welcome to join in the fun and excitement of this game. For more information, email mahjong@sjwomansclub.org. Contact Chairs Sally Beste and Diana Wirt for more information.